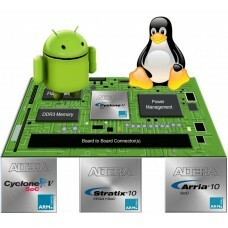 VEC221: Designing with an Altera ARM SoC. The courses is composed of two sessions, the first is mainly dedicated to the hardware, the second one will explore the software aspect paying special attention to Linux OS boot. Hardware session: Learn to design for a system containing the ARM® Cortex-A9 Hard Processor System (HPS). This course focuses on the hardware aspects of designing the SoC system & includes hands-on labs to get you up & running quickly. Learn to add & configure the processor component into a Qsys system. You’ll perform debug of the hardware system using standard debug tools such as SignalTap II logic analyzer & System Console. We’ll discuss hardware to software files handoff that simplifies aspects of software development. You’ll perform low-level debug of the FPGA interacting with the software debugger. We’ll also discuss various ways the FPGA & HPS components can be loaded & booted. At completion, you’ll be able to use the SoC device in your own design. Software session: It’s for firmware and low-level software engineers and is intended to teach you about software bring-up and development on the embedded ARM® Cortex-A9 in an SoC. The session isn’t intended to teach you software application or driver development, but rather concentrates on the unique aspects of the embedded HPS software flow in an Altera® SoC. You’ll learn everything needed to get started developing software for the HPS system, where to go for additional help, as well as how to use the Altera edition of the ARM DS-5 software development tool to debug your software.